Week four, cooked and consumed already during our One Local Summer. Husband was home again this weekend, so I was happy to step aside and let him take charge of the kitchen! The vegetable supply is really starting to diversify since so many farmers start seeds early, so we already have zucchini and snap peas available. The meal is a veal chop marinated in vinegar, salt and pepper, cider, and cilantro then grilled with some cheese on top. 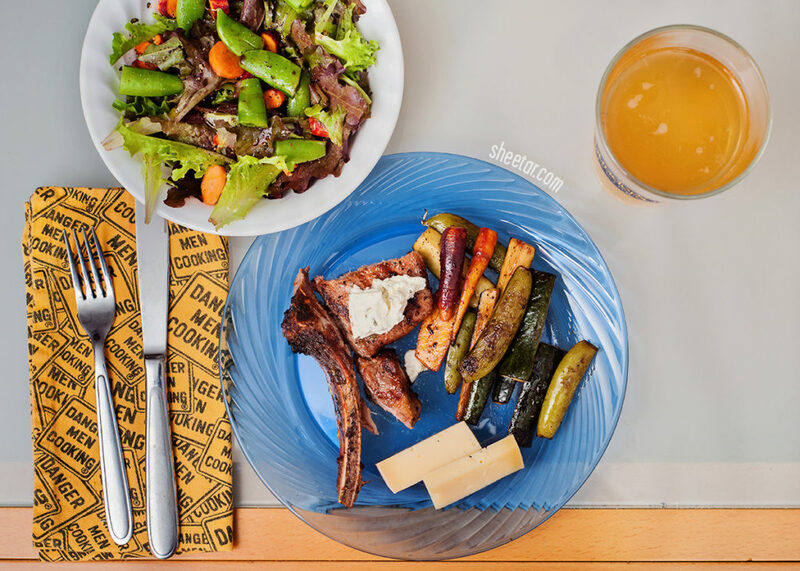 On the side are grilled carrots, snap peas, and zucchini and some more cheese (because there can always be more cheese), paired with a nice leafy green salad tossed with some olive oil and vinegar, and a glass of homebrewed cider. The cider we had here actually finished off a 5 gallon keg we’ve been nursing for over a year now, but fortunately we have the next batch ready to go, made from apples picked at my grandparents’ home some four hours west of where we live. Since the apples followed us on a trip we would’ve made anyway, I include them into local summer since their “food miles” didn’t count as just transporting food. We crushed and pressed the apples into cider ourselves, gave the juice some yeast, and let it do its thing. The resulting cider came out tart and dry, just how I like it, so while I’m a little sad to see this keg go, I’m also eager to see how the second batch tastes! Anyway, enough about the cider, the meal was a nice way to cap off the long holiday weekend since this was Monday’s dinner before husband left again for the week. Hopefully he’ll get in one last OLS meal before heading out on a long stretch for work, and then it’s all on me! I may have to entice some guest chefs to visit and contribute (read: beg friends to cook for me) during the summer. Husband is at it again for this installment of One Local Summer. 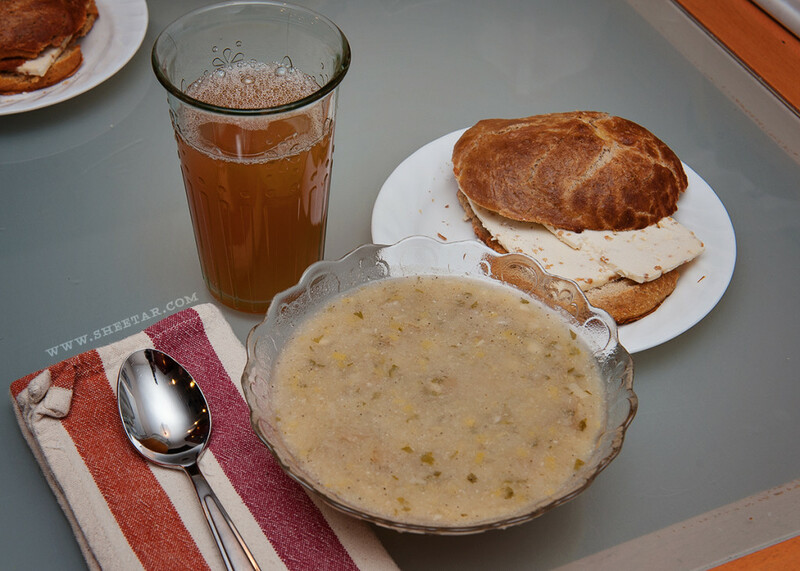 It was more like a One Local Fall sort of day – gloomy and rainy – so soup it is! The soup is a chunky potato leek soup since we happened to have all those things on hand and husband is truly the soup master. He somehow manages to make everything work well together in one pot whereas I tend to make disasters that skirt the line between edible and fodder for the garbage disposal. We used up the last of the pretzel rolls from the freezer and paired the roll with some mustard seed gouda made from local milk. 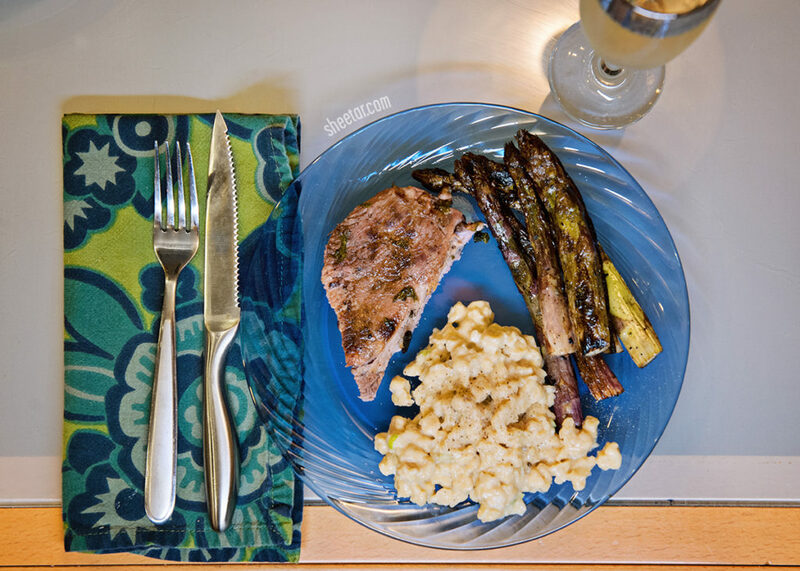 Top the whole meal off with a glass of cool cider and we have a filling and warm dinner for an icky day. This may be the last of the meals for 2015 seeing as there was a vacation happening during the time the last three OLS posts went up, but fear not, we’ll be back next year! The husband decided that we ought to use up some ground bison and make his own special on-the-fly version of Italian Wedding Soup. This was a collaborative effort, and what we came up with is absolutely incredible. It’s far from traditional, but it was incredibly delicious and definitely something that will be made again. We had made chicken wings the night prior (boil wings, then throw on grill to crisp) so we had the chicken stock on hand already. Other than that, the recipe is below, feel free to print, use, and enjoy! Preheat oven to 350F. Break egg into bowl, add bison, garlic, crumbled bread, and spices, mix together well with hands. Roll into 1″ round meatballs, place on greased cookie tray and bake in oven for 20 minutes. Heat broth on medium-high in large stock pot. add onions, carrots, potatoes, and salt and simmer while meatballs are cooking. Add meatballs to pot and simmer for 15 minutes. Add spinach and simmer until wilted. Top with your favorite grated cheese and enjoy!